The first is to open up the wrapper and throw it away before partaking of the chocolate-y goodness. The second is to open up the wrapper and then put it back in the bag/dish. I am a throw the wrapper away kind of girl. I hate putting my hand into the bag or dish and coming out with an empty wrapper. The rest of my family are the second kind. It drives me crazy! 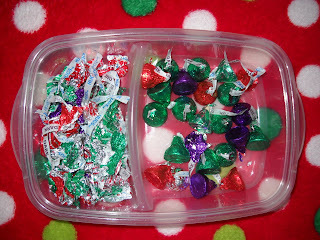 Last night when we were eating our Hugs and Kisses, and Thomas said that he was going to pour them in a bowl instead of using the bags.....I had an idea. Who wants a crystal candy dish when the fake Tupperware one will hold the candy and solve the problem of the wrappers! Judging from this picture, I think I need to make a store run before all of the on sale Christmas candy is sold out! *I am really enjoying Project 365, but I have been trying to figure out how to organize these picture posts....in an effort to de-stress my life (because some days there is just no time to post a pic) I have decided to do one Project 365 post each week on Sunday nights/Monday mornings - I will do all seven pics from the week in that one post. Ha, ha..too cute!! Good luck with your Project 365!! I know that a lot of people participate in that (my sister-in-law has a beautiful one!! ), and I think it's great!! Hang in there, and keep up with it, it doesn't have to be perfect. Set your own manageable, reachable, attainable goals--you can make the project your own. The main part is that you will have these moments to chronicle your year, and to grow in photography and life, and seek for that, not perfection. If you happen to make it the whole year, then you have that added boost of the completed project and personal commitment and goal, but it can be about more than just that!! Good luck!! You can do it!! Hey, now THAT is a great idea! LOL! I'm a throw-er away-er, too. I end up picking candy wrappers off of every surface in my kids' rooms. They have a hidden stash somewhere. I'm the throw it back in the dish type, simply because I don't want to carry around a handful of candy wrappers til I make that one trip to the waste can. I know sounds lazy but think of it as serving two purposes; #1)energy reduction and global warming which somehow I figure I'm helping the world by not making that one trip to the can.... (somehow) and #2) the game aspect where you try to find the candy by digging your hand around in the dish,... kinda like hide and seek; everyone likes a game? I too am the throw the wrapper away! What a bummer it would be if you really want a piece of candy and all you pull out is a bunch of wrappers!! Glad you were able find a solution!! Happy Saturday!